The importance of Esna dates from 18th Dynasty, when Thutmose III led his army into Nubia, and trade with the south was active. Only in Graeco-Roman times, however, did the area become sufficiently important to justify the building of a temple over some ancient ruins. 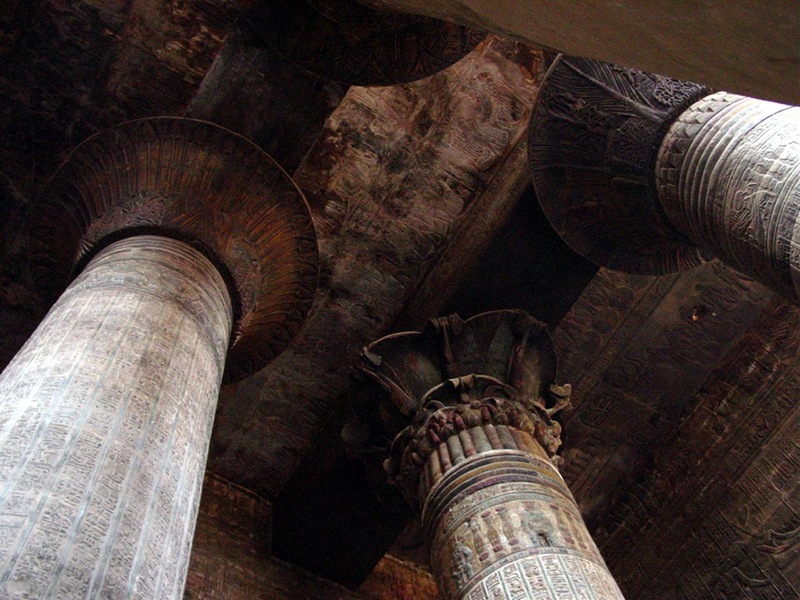 This is a small temple, built in honour of Khnum, the headed god of the cataract region (page 37). Little time is needed to view it. The temple is mainly of historic interest, since the name of the emperor Trajan Decius (AD 249-251) is the last Roman name to appear in a royal cartouche. The pronaos, or first hall, has a decorated roof supported by twenty-four columns in six rows. The first row are joined by balustrades, which form the front wall. The facade faces the Nile. Votive inscriptions for Claudius (AD 41-54) and Vespasian (AD 69-79) appear on each side of the sun-disc on the architrave over the entrance. That of Vespasian refers to him as ‘Lord of Rome the Capital’. The temple lies deep below the present ground level and is approached down a flight of steps. The capitals are elaborate and finely decorated - two feature bunches of grapes. The side walls show Roman emperors, clad in Egyptian dress, performing traditional ceremonies. They lay foundation stones and consecrate the temple. The reliefs, on the whole, are of poor quality. During the Roman period art was fast deteriorating. There was even such careless copying of hieroglyphic inscriptions that some parts of the text defy decipherment. The names of Claudius, Vespasian, Domitian, Trajan, Hadrian, Antoninus Pius, Marcus Aurelius, Commodus, Septimius Severus, Caracalla and Decius all appear. 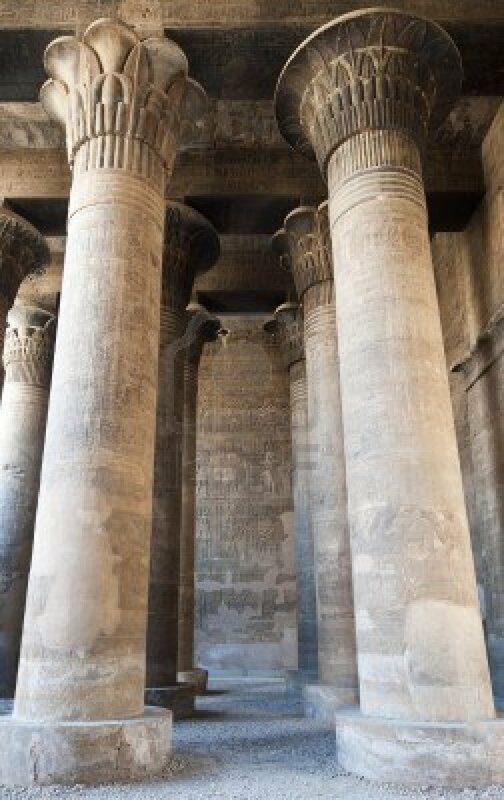 The heavily inscribed columns detail the religious ritual of the temple, preserving much detailed information from earlier times. On the lower registers of the right-hand wall (a) there is a fine relief that shows the emperor Commodus, depicted as Horus, joining Khnum in drawing in a netfull of waterfowl and fishes. In the net are some of Egypt’s enemies that have been caught along with the river creatures. This scene is watched over by Egyptian deities. The reliefs on the rear wall, which date to Ptolemaic times, are more delicately executed than those of the Roman period. On the right-hand wall (b) sacrifices are made to Khnum. On the left-hand wall (c) Khnum is being offered a potter’s wheel. At the centre of the rear wall is a portal, resembling a pylon, crowned with a concave cornice; the portal originally led to the inner chambers of the temple, which have been destroyed. On the outside side walls of the Temple, to the left and right (d) and (e), the king is shown holding groups of enemies by the hair and smiting them, with lists of the conquered territories below.